Heterogeneous computing systems expose different programming APIs for measuring metrics of interest, such as execution time or energy usage. 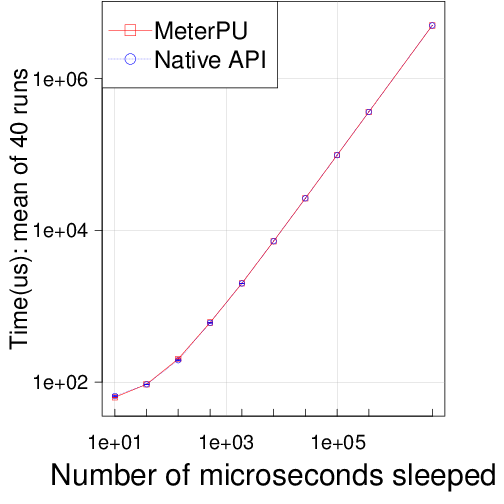 MeterPU is a C++ template library that provides a simple, uniform measurement API that is both device independent and generic in the metric to be measured. The actual, platform-specific measurement functionality can be specified for each platform by plug-ins. MeterPU is a portable "software-multimeter" library for C++. 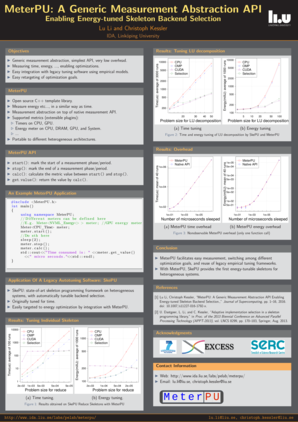 Its current implementation supports GPU-based systems. Energy meters are well tested on Intel Xeon CPU E5-2630L v2 and Nvidia K20c. 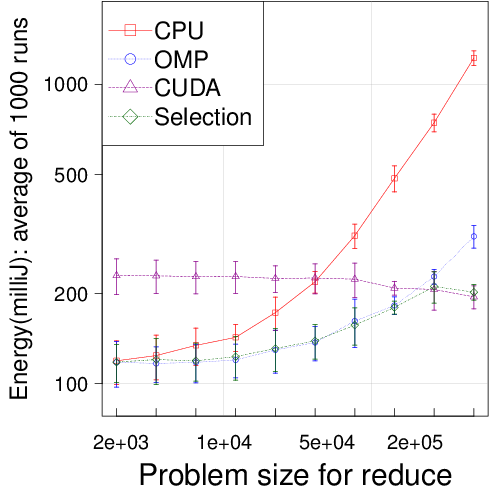 For measuring CPU energy, it requires intel PCM installed, and root privillege to run. Not all hardware support for CPU and GPU energy, please check the compatibility for Intel PCM and Nvidia TDK library. See also a quick start guid in the html or pdf documentation generated by doxygen. //Output: Time consumed is: 500100 micro seconds. //Do sth here, typically a cuda call, here simplified. //Output: Energy consumed is: 87516.9 milliJ. 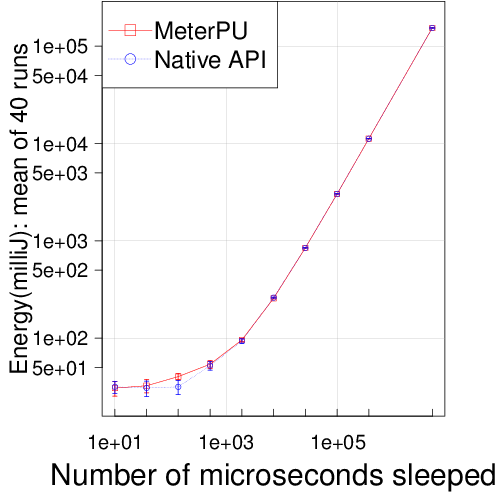 MeterPU has been used to make the SkePU skeleton programming library energy-tunable. 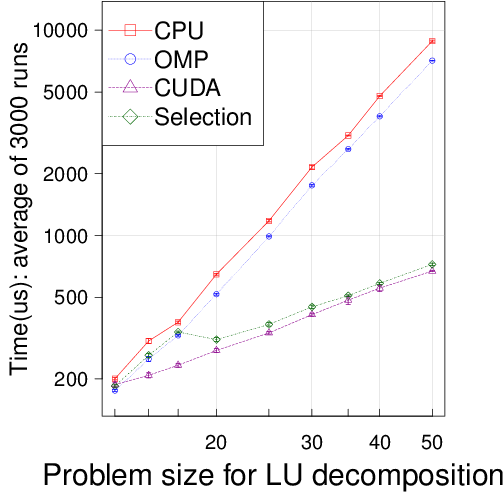 The following plots show that, with MeterPU, SkePU can be easily retargeted to energy tuning by automatic backend selection, here for Reduce Skeleton and for LU decomposition. 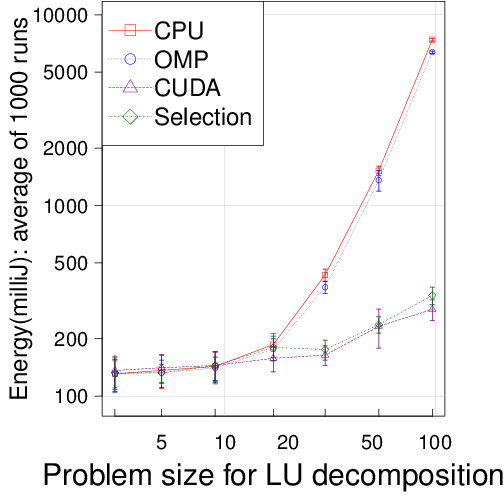 The integration can provide up to about 12x in time speedup and about 21x in energy reduction on LU decomposition, and the savings will continue to increase as problem size increases beyond the maximum used in our experiments. 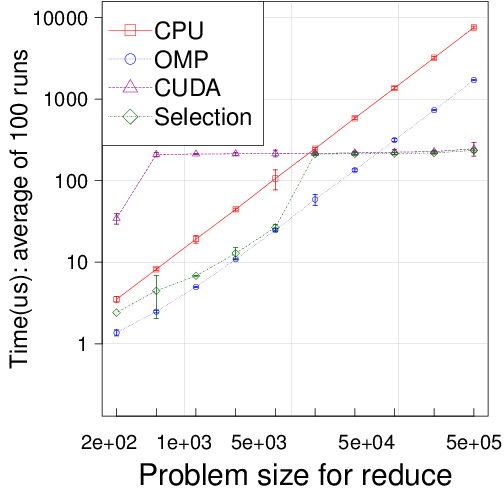 MeterPU's overhead is only one extra function call, and nonobservable in our experiments. MeterPU is licensed under the GNU General Public License as published by the Free Software Foundation (version 3 or later). For more information, please see the license file included in the downloadable source code. MeterPU is a work in progress. Future work includes adding support for more metrics, platforms, and plug-ins. This work was partly funded by the EU FP7 project EXCESS and by SeRC project OpCoReS. We also acknowledge our colleague Erik Hansson for his constructive feedbacks for this work.